We received a response from Coca Cola regarding our campaign, asking the sponsors of PyeongChang 2018 Winter Olympics to help bring an end to the dog and cat meat trades in South Korea. We are disappointed with this response. Please send your letter, post on their Facebook page, tweet, and/or call,… We must not give up until the millions of dogs in South Korea are free from this nightmarish cruelty. Video: Dog transport from Jeju, South Korea. CARE (Coexistence of Animal Rights on Earth). Shame on you .. let’s see if it were humans being tortured like the dogs and cats of Korea would you still have the same mindset? I think not! Shame on you!!!!! I know what I will be boycotting in the supermarket .. Its poison anyway! I just purchased my last Coca Cola product! Shame on them!! I am not surprised by your vague letter of response. For you it is all about money and business. The hell with you and your products!!! 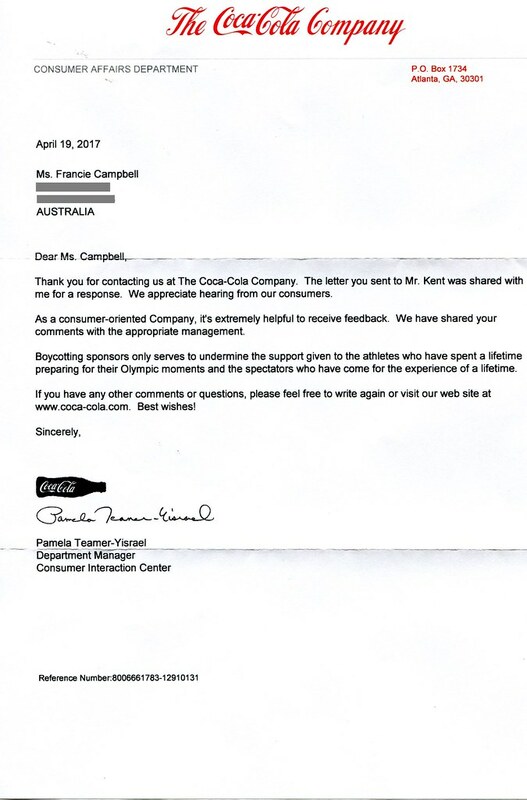 I’m not surprised with Coca Cola’s response. Profit is God and above all, animal or human cruelty or not. On the other hand, they make a small good point about the preparation athletes undertake to take part in Olympic events. With many years practice I don’t think any athlete from any country in the world even the so called civilized western societies, would boycott the Korean sports events. We have to keep on fighting for our animals in other ways, signing petition, writing to authorities, making donations to legit organisations etc. So I should care more about an athlete’s selfish pursuit for personal fame and glory over countless animals suffering excruciating, angonizingly brutal deaths? What’s more important? How do you even enjoy the Games and “sport” when you know that this is going on in the background. The things that were happening to dogs at the Sochi games made me want to vomit and now im beginning to associate the winter olympics with animal cruelty in general since nobody involved in the olympics seems to give a crap about compassion or decency. What is wrong with people and humanity nowadays? Your petitions only scratch the surface. They wont prevent or stop anything. You have to hit them where it hurts which is in the wallet. Bravo! well said and agree! Totally agree. I alrady boycott Coca-Cola after Sochi. I will never forget this “responce”. I would like to believe that if the athletes were given the choice to quench their thirst with a Coca-Cola or stop the cruelty, they would choose to stop the torturing and instead drink water. Coca-Cola is only looking out for themselves. Not for the athletes or the animals! I wonder if the spectators, athletes and all others involved in the Olympics will also experience the horrific brutality the dogs and cats of this disgusting nation take part in. Be sure to take a stroll into the dog meat market, select the poor tortured soul of your desires and hang out for the spectacle of your choice being prepared for you. Coca Cola is is disgustingly selfish to take a non-stance on the violence against millions of innocent animals being tortured their entire lives just to have them end in the most gruesome ways imaginable. Personally, I’ve never liked the taste of Coke anyway and have no problem never buying or taking another sip of your poison for the rest of my life! Korea is making a point of hiding their dog meat restaurant items and such during the Games so it’s likely that they will try to do the same thing with the markets and slaughterhouses as well. They dont want spectators to see what really goes on in Korea and the shadow of the olympics. Spineless. I will no longer purchase their products. Shameful they will continue to support an event and country that tortures and consumes domesticated animals. Boycott COKE!!! Money talks!! Put them out of business!! Then they will never be in this position again. Shame on you Coca Cola , You don’t care about this issue of animal torture ! I will not buy your products again ! Shame ! Shame ! Shame ! I just drank my very last coke product! I may not be able to change your mind, but I sure as hell can boycott your products! I won’t buy your products again (and I buy them a lot) and I will spread the word that you are a craven and amoral company. Why does the work of athletes have to be supported at the price of the unimaginable suffering of helpless and creatures? I will never buy any of your products again, it is horrific that you have the chance to help stop this evil and you refuse, how many of you are pet owners ? would you let that happen to your cat or dog ? Very disappointing, I am sure many of the Athletes are animal lovers as well. Cowardly act for your company. You should hang your heads in shame. An athletes brief second of glory is put before the lives of thousands of innocent animals who die the most horrific deaths. A fine example of greed, and insensitivity by the human race at its best. I’m disgusted. What an absolutely stupid and pointless response from Coke. It’s patronizing garbage! I have never been a consumer of Coca Cola products and this demonstrates why. What should of happened is when countries tender to host an Olympic Games, their dirty laundry should be taken into consideration. How many Olympians would want to participate in an Olympic game in North Korea or in any country at war. I doubt it. No medal is worth it. The problem is we are talking about 100’s of thousands of dogs here. Not backyard breeding. There are 13 restaraunts that are undergoing transformation to serve anything but dog meat. Then, when the Olympics is over, guess what, dog meat is back. The videos show it all. The torture, how the animals are treated,how they are boiled and burned alive. I am ashamed to be human when I see this. I am sure there are many other animals having the same issue in other countries and we just don’t hear about them. Goodbye Coca Cola on my grocery list or anything associated with the companies. I personally emailed them saying i will not buy their product anymore. As an athlete I would be embarrassed to participate in these Olympics. The opportunity for a medal or the chance to make a change and stop the deplorable murder of cats and dogs…. Shame on Coca Cola. DISGUSTING. Let me paraphrase: Boycotting the sponsors (aka – Coca Cola) will be bad for our ROI in this event, so please ignore the horror, the torture, the cruelty & buy our poisonous crap anyway. Can I say again … Coca Cola you DISGUST ME. I’m divesting my stock & boycotting your vile, shameful company. Disgusting response from coca cola.i will never buy their stuff again.more interested in making money than animals suffering horrifically. Hope they choke on their coke. Take the Athletes that are to compete in the Olympics and let them see what the named countries are doing to the Dogs, show the Athletes the Cruelties inflicted on the Dogs that are to be eaten then ask the Athletes if They agree what is happening is okay. I don’t know why anyone would expect Coca Cola to stand up against inhumanity Coca Cola is a Greedy Money Grabbing Company who are not going to want to jeopardise their Humongous Profits. Never do I buy Coca Cola anymore. I Never drink coke but now will make sure all my friends and family know about coca cola position in this matter, and will most definetely encourage them to boycott coca cola and stop buying their drinks, shame on you Coca Cola very diappointed by the lack of committment and empathy towards these poor dogs. I certainly wouldn’t buy any of their products. I wouldn’t support any company that doesn’t have a heart. I have consumed Diet Coke my whole life. Probably one of your BEST CUSTOMERS ON THIS PLANET for over 70 years no matter what country I have lived in at the time. With the different organizations I have played a major role in, whether on the board of directors or in top management, I have seen that Coca Cola versus Pepsi products were the choice for our employees and public. In other words, I stuck up for you when the switch to Pepsi products and the incentives they provided was overtaking your market. That said, your callousness on this issue when peoples of all nations, societies and global corporate conscience need to be on the right side of history, will show as one of the premier companies in the world, all Coca Cola is interested in is selling cans of soda pop. How utterly shallow. Stand for something besides corporate profits. You are on the world stage and your actions whether by commission or omission, say something to the world. You had a chance to get the world’s attention and you made a disappointing choice. WATCH SOME OF THESE VIDEOS. DON’T TURN A BLIND EYE and see what goes on in this country of vile and horrific cruelty which is approved of by the same government as a matter of how it operates daily..
By supporting this government as it wants to showcase its country and lifestyle, you are supporting what they condone and support, sadly of which is the wholesale slaughter and torture of domestic animals. Koreans believe the more an animal suffers while dying, they believe the release of hormones makes the meat tastier. They stick burning cigarettes in dogs eyes to and skin them alive. They boil animals alive. Yet you want to support this. What would it take for such a barbaric country to do to lose your support? Something like the Taliban stoning women or beheading people all the time? What level of cruelty is too much for you? World conscience and corporate accountability is a valid modern day paradigm which many corporations are embracing to help shape a better world on issues like this and many others. These are organizations which realize their roles are more than just selling things to the world. They are corporate citizens of the world and as such realize they should help shape the world when they see broad injustice and crimes of abhorrent cruelty. Yes, of course, there are organizations that refuse to acknowledge or deal with the existence of cultures with embrace and support atrocities because its easier to take the low road. They prefer to just worry about how a corporate stance may impact their bottom line. Your excuse of wanting to support “games and medals” instead of insisting on basic “humane” behavior puts you in this last isolationist category of organizations. We are sorry that your position appears to be that you will remain in the shadows and silent on egregious issues of our time. This activity is shameful to every civilized society. You’re aren’t civilized or educated. Wth you think torturing companion animals makes meat taste better?? I can see you’ve never had basic science courses. Are we next to find out you’re torturing cows, sheep then children? I will never purchase anything from any of these dog torturing countries. I can see eating if starving, but the cruelty is beyond the pale. You are dishonored and humiliated as u should be. Any Sponser that doesn’t stand up against this barbaric practice in the name of the almighty dollar and political correctness is appalling, I will not buy any of these products and will tell everyone I know about you!! I wonder why in the world so many people continue to drink such a crap!